Hope everyone is doing well! Got plans for Valentine’s Day coming up? I know I have a date with some of these newer Commander cards in our latest set, especially now that Rakdos the Showstopper has shown up for some awesome shenanigans. You can look forward to a chaotic Rakdos deck on Christian Alexander‘s future Playgroup Brews! Enough about the new set, though. I’m sure there has been plenty of coverage about the new cards. In case you don’t know already, Kya likes to do things differently than the rest! Instead of looking forward to new cards, I’m going to show you how to get excited about your old cards! I’ve written a previous article about using your collection to make an awesome EDH Cube. However, I admit that might be far too involved or troublesome for many people. So what are we going to do, then? Well, we’re going to find a much more creative and simpler method to get some use out of cards you just don’t find worthy of your EDH decks themselves. That’s right! We’re going to create our own variant. I thought this was an important topic to discuss for this month’s article. I’d think many would agree that EDH is becoming an increasingly popular format. With this, the power level and the rigidness of the format continues to rise as well. I don’t necessarily think competitive EDH is a bad thing. In fact, I enjoy playing it, and quite often. However, I think it’s important to occasionally fall back to the roots of EDH and why it was created. It was a format made for fun, originally a slight step above kitchen-table Magic. House rules and silly brews were encouraged, as the format’s rule set was designed as little more than a guideline. So why not play with the very strands of the EDH DNA itself every once in a while? It’s a fun exercise for you and your playgroup. Do you want to try out an EDH game with Planeswalkers as commanders? 200 card decks to play Battle of Wits? An Unstable deck? Have at it! Remember that at the end of the day, these are your cards, and your group can play them as they wish. I’m sure you have played (or at least heard of) variants such as Kingdoms/Sheriff or Emperor. We’re all introduced to these the same way. 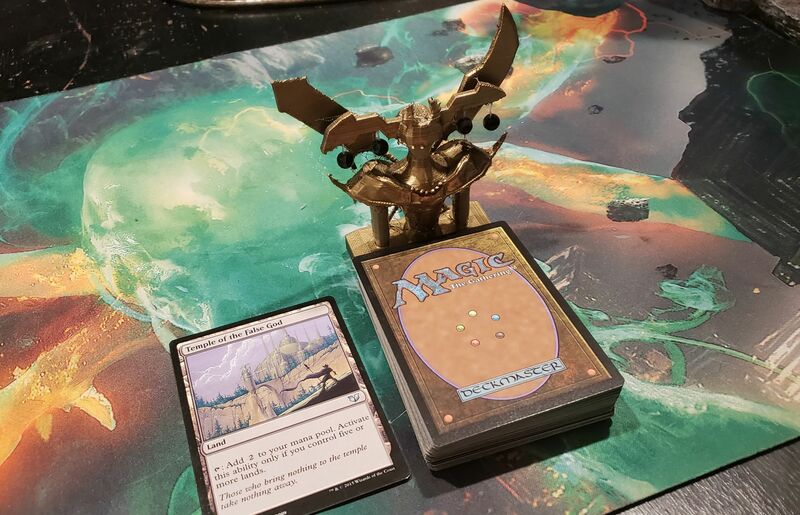 Someone walks into the store and brings up a fun idea to spice up the EDH table. You learn the rules after a quick explanation and quickly start up. Next thing you know, everyone is having a great time, all because someone out there randomly made these variants out of nowhere. So why can’t you? Now, I know what you’re thinking. That’s a nice little Public Service Announcement, but what does that have to do with your old cards? Well don’t worry, because I’m about to show you! This was a silly variant I created a while back when I was trying to find a home for various cards I loved, but just never quite made the cut in any decks. Not-so-great mana rocks, overpriced spells, and sub-par creatures… all stacks of cardboard I have far too many of. I owned them for a reason, darn it, so it was time to give them a purpose! The true spark that ignited the idea was when the Karona, the False God deck I created fell flat on its face. At the end of the day, you build Karona around her pass-me-around ability or around a tribe. It becomes very difficult to balance both and still be effective. That, and the fact that people have no problem sacrificing your commander when they get a hold of it, or beating you to death with your own card. This was a massive disappointment, as I’ve always loved the lore of Karona and like to make my decks thematic. I then attempted to make a Curse deck shortly thereafter, using cards like Curse of Shallow Graves to encourage my opponents to hit each other instead of me, but it didn’t make her much better. So what did I end up doing with all these cards that were just sitting there doing nothing? I built an entire deck similar to Planechase. A 60-card deck that’s placed in the middle of the table, with Karona at the helm. The deck itself is full of “curse” cards, as well as various “blessings” Karona can provide you during your turn. You play EDH like normal, but at any main phase you can “pray” to Karona for her blessing. You then draw from the Karona deck to determine your fate! Karona is a jealous god, though, and if she’s not prayed to enough times in a row, she comes out with a vengeance! Because describing a variant can be a bit confusing, I’m going to break down the rules as well as provide a video to explain how the variant is played. A 60-card deck, comprised of 30 “curse” cards and 30 “blessing” cards, is placed in the middle of the table, with Karona on the field as its commander. The deck is similar to Planechase, where you cannot interact with it with effects like Gonti, Lord of Luxury and such. Any time at sorcery speed you may “pray” to Karona. If you do, you draw a card from her deck and cast it. If you get a “curse” card, you must target yourself. If it’s anything else, you choose all legal targets. If a player chooses not to pray to Karona 3 times, or if Karona is not prayed to 3 turns in a row, Karona comes out on the field under the current player’s control at the beginning of their end step. Remember, this means she’ll immediately switch control to the next player at the beginning of their upkeep. When Karona is out, players MUST pray to her. She does her own commander damage as well, so watch out! Extra rule for those who are brave enough: choose a number between 7-10, and if Karona stays in play for that many turns in a row, everyone loses! Get everything so far? I think it’s fairly easy. After all, the fewer rules there are, the easier it is for people to play your variant. However I’m sure some might be curious what is in my 60-card curses-and-blessings deck! Let’s go over some of the aspects of the Karona deck itself. Let’s start off with the fun part! If you’re unfamiliar with Curse cards, they’re pretty fun. You essentially cast a hex on a player, which has various potential consequences. It can either help the victim’s opponents, or make the victim’s life a living hell. Unfortunately, most of the Curse cards are sadly underpowered, and making a deck of them is often more thematic than powerful. That’s perfect for our purposes, though! Because they are so minimal, they won’t horrifically warp your relatively regular game of EDH. Remember, these Curses automatically enchant you when you flip them! Now for the real reason I made this variant. I can’t stress to you how many cards I own that were so close to making it in my decks, but just couldn’t quite get there. Card draw spells, heavy mana rocks, various kill spells… the list goes on. Now they finally have a purpose! If you believe in Karona enough and prove yourself worthy of her affection, you can be blessed with one of these amazing gifts! It was around the time of Hour of Devastation I created this format variant. I had plenty of these fun God-inspired sorceries. I thought they would make a perfect edition to this deck. They can either be a gift or an annoying curse depending on the current game status. Want to add your own theme to the format? It’s yours to edit as you want! Of course, it wouldn’t be any fun if there wasn’t a true risk involved! Put your hopes into Karona, and sometimes she’ll reward you, but sometimes, she’ll force you to feel her wrath! I added a few nasty cards to poke at the back of everyone’s minds as they draw into her deck. A poorly timed Doomsday isn’t something I think anyone wants to draw. Hopefully you get where I’m going with this. Below is the full list that I myself use. However, it’s completely up to you on how you want to build your own Curse of Karona Deck! It wouldn’t be much of a variant if I didn’t add accessories to it! This time I’m going to build myself a proper altar to pray to my False God! I’ve been learning a new 3D program, as my old one expired, so it’s been an aggravating process. However, because I my readers so much, I pushed through it and learned how to get it done! I was originally going to build myself a full model of Karona to represent her. However, I thought it would be more fun to instead build an altar upon which Karona’s deck can be enshrined! With this in mind, I only built her top half. I have a habit of building copies as I go, in case I end up damaging the vertexes as I edit things. This creates a fun step-by-step image of the creation! As always, it starts as a box. 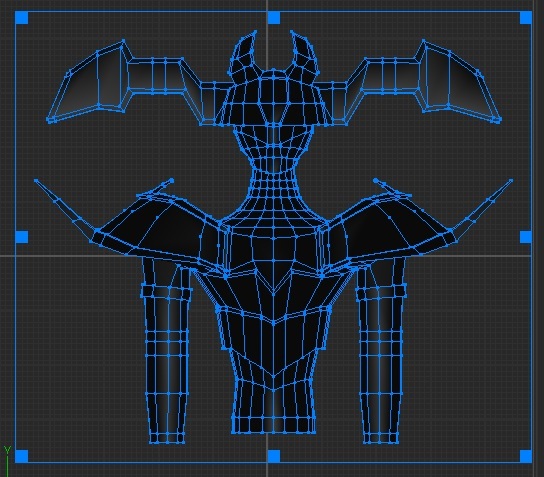 From there we extend the basic neck and torso. Soon after, we add in the armor and the strangest helmet in the multiverse. The spears were super fun to make! You may notice that we’re missing the orbs hanging off her helmet. That would have been a nightmare to print, so I decided I would add beads on string instead after it’s printed. And behold! Karona’s flesh is slowly coming to life! Karona’s favored Zealot, Clementine, is faithfully standing guard to ensure her safety. Here she is in her majestic, False God fury! With a little gold paint and the hanging beads, I think she’s ready to be the centerpiece at my table. Maybe one day I’ll add in more detail, but I have a feeling she’s going to get thrown around and smashed by players who find themselves in the wake of her ire, rather than in her good graces! 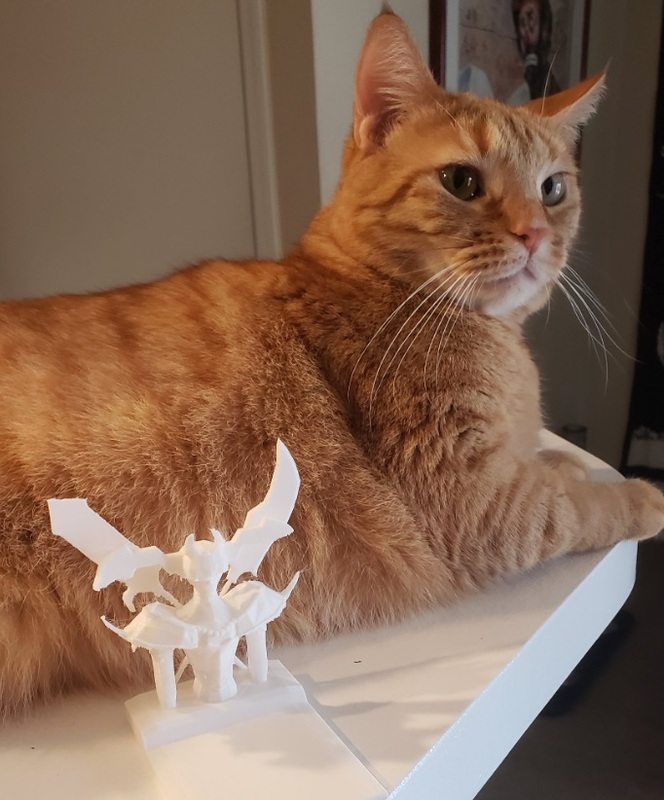 Download of the 3D print can be found here. So what did you think? Would you give Curse of Karona a try every so often? I know in my group that we have a total blast with this variant. It’s almost embarrassing how much we get in character when praying to an unsleeved deck, too. You can definitely tell, even from across the store, when a group is playing this variant, because you’ll hear folks cursing the name of Karona just as frequently as you’ll hear them begging for a mana rock. I’m curious on what sort of variants you play! We’re always looking for fun ways to mess around with the Commander format. If it’s a lesser-known variant, please list out the basic rules so others can try it out! Please feel free to use the comment section as a hub for good variants! Hopefully if enough add in we’ll have a nice reference for those looking to change things up in their games.